When the circuit board passes reflow soldering, it is easy for the board to turn up. If it is serious, it will cause the element to be soldered and erected. How to overcome it? 1. Damage of PCB circuit board deformation. In the line of automation surface-mount circuit board if not smooth, can cause positioning, components can’t instrumentation or stick into the hole of the board and surface fabrication tray, even crashed automatically installed.The circuit board of the component is bent after welding, and it is difficult to trim the components.The board also can not be installed in the machine box or the socket in the machine, so, the assembly plant to meet the plate warping is also very troublesome.At present, the surface mount technology is developing towards high precision, high speed and intelligent direction, which puts forward higher flatness requirements for PCB board as the home of various components. In the IPC standard, the maximum deformation amount allowed by PCB board with surface mount device is 0.75%, and the maximum deformation amount allowed by PCB without surface mount is 1.5%.In fact, in order to meet the requirements of high precision and high speed stickers, some electronic assembly manufacturers are more strict in their demands for deformation. PCB board consists of copper foil, resin, glass cloth and other materials. The physical and chemical properties of each material are not the same, and the heat stress residues must be produced when pressed together, resulting in deformation.At the same time in the process of PCB processing, through high temperature, mechanical cutting, wet process and other process, will produce a significant influence on the plate deformation, in short can cause of PCB deformation is complicated, how to reduce or eliminate caused by different material properties and processing, the deformation of the PCB manufacturers one of the most complex problems. 2. Analysis of causes of deformation. Deformation of the PCB need graphics from the material, structure, distribution, processing process from several aspects such as study, this article will deformation may be produced for a variety of reasons and improving methods are analyzed and expounded. The copper surface area on the circuit board is not uniform, which will make the plate bend and the plate warped. General circuit boards will be designed with a large area of copper foil for grounding, sometimes Vcc layer has designed a large area of copper foil, when these large areas of copper foil can not evenly distributed in the same circuit boards, will cause uneven heat and cooling speed, circuit boards, of course, also can heat bilges cold shrink, if increases and cannot at the same time can cause different stress and deformation, the temperature of the board at this time if the Tg has reached the upper limit value, the board will start to soften, causing permanent deformation. The link points on each layer of the circuit board (vias, through the hole) will limit the shrinkage of the board. 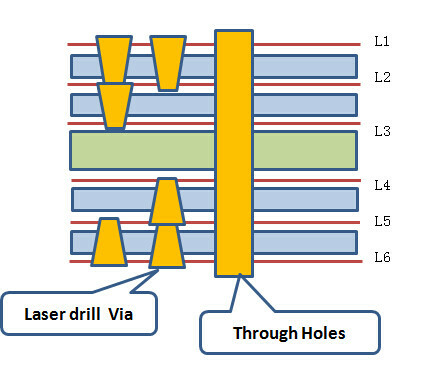 Today most of the circuit board for laminated, and between layer and layer would be like rivet connection point (vias), connecting points is divided into hole, blind hole and buried hole, there is connecting points will limit the board up the effect of cold, can also indirectly cause plate bending and become warped. The weight of the circuit board itself can cause the deformation of the board. General back to soldering furnace can use chain to drive the circuit board in soldering furnace back to go forward, namely to on both sides of the board when the fulcrum of propping up the whole board, if the board with heavy parts, or the board size is too big, because of their own kind of quantity is present to the phenomenon of the middle sag, resulting in plate bending. The depth and connection of v-cut can affect the deformation of the jigs. Basically, v-cut is the main culprit of the destruction of the board structure, because v-cut is Cut out of the groove on the original sheet, so the v-cut is prone to deformation. 2.1 nose analysis of the deformation of plate parts by pressing materials, structures and graphs. The PCB board consists of the core plate and the semi-solidified sheet and the outer copper foil. The core plate and copper foil are subjected to thermal deformation during the compression. The deformation amount depends on the thermal expansion coefficient of the two materials (CTE). The thermal expansion coefficient (CTE) of copper foil is left and right. The above TG points are (250~350) x10-6, and X to CTE is similar to copper foil because of the existence of glass cloth. When the temperature is raised to a certain area, the substrate will be converted from “glass state” to “rubber state”. The temperature at this time is called the vitrification temperature of the plate (Tg).That is to say, the Tg is to maintain the rigidity of base material the highest temperature (℃).In other words, the common PCB substrate material in the high temperature, not only produces softening, deformation, melting and other phenomena, but also in the mechanical, electrical characteristics of the sharp decline. Generally, the plates of Tg are above 130 degrees, and the high Tg is generally greater than 170 degrees, and the medium Tg is about 150 degrees. Usually Tg is greater than 170 PCB printed board, called high Tg printing plate. The Tg of the substrate is improved, and the heat resistance, moisture resistance, chemical resistance and stability of the printed plate are improved and improved.The higher the TG value, the better the temperature resistance of the plate, especially in the lead-free process, the high TG application is more. High Tg refers to high heat resistance.With the rapid development of electronic industry, especially the electronic products represented by computer, toward high function, high multiple stratification, need PCB substrate material of higher heat resistance is an important guarantee.The emergence and development of high-density installation technology represented by SMT and CMT make PCB more and more dependent on the high heat resistance of the substrate in small aperture, fine line and thin type. Commonly so FR – 4 and the difference between high Tg FR – 4: is under the hot, especially in the heat after moisture absorption, its material mechanical strength, dimensional stability, adhesion, water absorption, thermal decomposition, thermal expansion situations vary, such as high Tg products is significantly better than the ordinary PCB substrate materials. Which make the expansion of the inner graphic core board because the graphic distribution and core board thickness or different material properties are different, when the graphical distribution and core board thickness or different material properties are different, when the graphical distribution more uniform, material type, won’t produce deformation.When the pressure structure of PCB laminate is not symmetrical or uneven, the CTE of different core plates will be different, which will cause deformation in the process of compression.The deformation mechanism can be explained by the following principles. FIG. 1 dynamic viscosity curve of ordinary semi-cured film. Suppose there are two kinds of CTE large difference of core board through A curing press together, in which A core board CTE is 1.5 x10-5 / ℃, core board length is 1000 mm.In the compression process, as the semi-solidified film of the adhesive film, the two core plates are bonded together by softening, flowing and filling the graph and curing three stages. Figure 1 for ordinary FR – 4 resin under different heating rate in the bottom of the kinematic viscosity curve, in general, materials from 90 ℃ to flow, and achieve above TG for the start of crosslinking curing, and a half before curing curing state for freedom, the free expansion core board and copper foil in a heated state, its deformation can through their worth to the CTE and temperature change. At this time, the deformation of two core plates are respectively. At this time, because the semi-curing is still in the free state, the two core boards are long and short, non-interference and no deformation. , as shown in figure 2, and press fit will remain at high temperatures for A period of time, until A cure completely cure, resin to curing condition, at this time can’t flow, two kinds of core board together. When the temperature drops, without interlayer resin bound, core board will be back to the initial length, will not produce deformation, but it’s actually two core board at high temperature has been cured resin bond, not voluntary contraction in the cooling process, in which A core board contraction should be 3.75 mm, actually when the contraction is greater than 2.25 mm is hampered by A core board, to achieve the force balance between the two core board, B core board can’t shrink to 3.75 mm, and A core board contraction will be greater than 2.25 mm, so that the whole plate bending towards B core board, as shown in figure 2. FIG. 2 deformation of different CTE core plates during compression. Based on the above analysis shows that the PCB laminate structure, material type has graphics are uniformly distributed, a direct impact on the different core board and the CTE differences between copper foil, increases and differences in the bonding process integration half solidification process of solid piece and is retained and eventually form a PCB deformation. 2.2 deformation caused by PCB processing. The deformation reasons of PCB plate processing are very complex and can be divided into thermal stress and mechanical stress.The thermal stress is mainly produced in the process of compression, and the mechanical stress mainly produces the stacking, handling and baking process.The following is a simple discussion of process order. Copper sheet: the copper plate is double panel, symmetrical, no figure, copper foil and glass cloth CTE are very similar, so in the process of compression, there will be almost no deformation caused by different CTE.However, copper clad press size is big, hot plate of different regional difference in temperature, will lead to different areas in the process of pressing resin curing speed and degree has a slightly different, at the same time under different heating rate, dynamic viscosity also have bigger difference, so also can produce local stress caused by the difference curing process.In general, the stress will be balanced after compression, but will gradually release deformation in the later processing. Compaction: the PCB pressing process is the main process of producing thermal stress, in which the deformation due to different materials or structures is analyzed in the previous section.Like copper clad bonding, also can produce curing process difference, the local stress of PCB due to the thickness of the thicker, graphical distribution variety, half cured more reasons, such as the thermal stress will be more difficult to eliminate than copper clad more.The stress in PCB board is released in the process of drilling, shape or BBQ, resulting in deformation of the plate. Resistance welding, characters such as baking process: as the solder resist ink curing can’t stack with each other, so the PCB will be set on the shelf in the baking plate curing, resistance welding temperature about 150 ℃, just over middle and lower Tg material point of Tg, Tg above resin as high elastic state, plate easy under the action of gravity or oven blast out of shape. Hot air solder leveling: ordinary plate hot air solder the usual tin stove temperature is 225 ℃ ~ 265 ℃, time of 3 s to 6 s.Hot blast temperature is 280 ℃ ~ 300 ℃. The usual board solder from room temperature into the tin stove, two minutes after post-processing wash and room temperature.The whole hot – wind solder leveling process is a quenching process.Because the circuit board material is different, the structure is not uniform, the thermal stress is inevitable in the process of cold and heat, resulting in microcosmic strain and whole deformation warped area. Storage: the storage of PCB board in the semi-finished product stage is usually firmly planted in the shelf. The improper adjustment of the shelf, or the stacking and placing plate in the storage process can cause mechanical deformation of the plate.In particular, the impact of the thin plate below 2.0mm is more serious. In addition to the above factors, there are many factors that affect PCB deformation. How can we prevent plate bending and plate warping in the plate? 1. Reduce the influence of temperature on the stress of the board. Since “temperature” is the main source of board stress, as long as the lower back to soldering furnace temperature or adjust the board in the welding furnace heating and cooling speed, can greatly reduce the plate bending and become warped.But there may be other side effects. 2. High Tg plates are used. Tg was the glass transition temperature, the temperature of the material by the glass state into a rubber state, the lower the Tg values of material, said its board to enter back after soldering furnace began to grow soft the faster the speed, and become soft rubber state time will be longer, the deformation of the board, of course, the more serious.The higher Tg plate can increase the ability of stress deformation, but the price of relative materials is higher. 3. Increase the thickness of the circuit board. Many electronic products in order to achieve the purpose of the thinner, the thickness of the board has the 1.0 mm and 0.8 mm, even as by the thickness of 0.6 mm, the thickness of this to keep the board with no deformation after welding furnace back, really stand, suggested that if there is no frivolous request, the board is best can use 1.6 mm thickness, can greatly reduce the risk of plate bending and deformation. 4. Reduce the size of the circuit board and reduce the number of jigs. Since most of the back weld furnace use chain to drive circuit board, the larger the size of the circuit board will be because of the weight of its own, concave deformation in the welding furnace back, so try to put the long side of the circuit board as an edge on the chain back to soldering furnace, can reduce weight sag deformation caused by the circuit board itself, to reduce the number of the makeup is also for this reason, that is to say, a furnace, as far as possible with narrow edge perpendicular to the direction of the furnace, can achieve the lowest sag deformation. 5. Use the furnace tray fixture. If the above methods are difficult to achieve, the last is to use a stove tray (reflow carrier/template), to reduce the deformation of a furnace tray can reduce the plate bending plate become warped because both thermal and cold, all hope that the tray can hold the circuit board to wait until the temperature of the circuit board below the Tg values began to harden, can also maintain the size of the garden to. If a single layer tray is not possible to reduce the deformation of the circuit board, it is necessary to add a layer of the lid, the circuit board with two layers of pallets clamp up and up and down so that it can greatly reduce the circuit board back to the matter of the welding deformation of furnace.But it is expensive to pass the oven tray, and it has to be manually placed and recycled. 6. Use real connection, stamp hole instead of v-cut board. Since v-cut can damage the structural strength of the boards, try not to use v-cut boards or reduce the depth of v-cut. The effect of different materials on the deformation of plate. The defect rate of the deformation of different materials was calculated. The results are shown in table 1. Can see from the table, low Tg material deformation defects than high Tg, the high Tg materials are shown as packing materials, however, are less than lower Tg materials, after pressing during processing at the same time, baking temperature 150 ℃, the highest impact on lower Tg materials would be greater than high Tg material. Engineering design should try to avoid the asymmetric structure, the material is not symmetric and asymmetric graphics design, in order to reduce the deformation of produce, at the same time in the study also found that core board direct bonding structure more easily than copper foil pressing structure deformation, such as to when the design flexible use.Can reduce the deformation effect caused by design. The effect of compression on deformation is very important, and the stress can be effectively reduced through reasonable parameter setting, press selection and lamination.For the general structural symmetry of the plate, it is necessary to pay attention to the symmetrical laminated plate, and to place the tool plate, cushioning material and other auxiliary tools.Both cold and hot pressure machine integrated also have significantly help to reduce the thermal stress, the reason for the hot and cold fission press under high temperature (GT temperature above) will turn to cold press machine, panel material above Tg point pressure loss and rapid cooling can lead to a rapid release of thermal stress deformation, and the end of the cold and hot pressure machine can realize integrated hot-pressing temperature, avoid panel under high temperature pressure loss. At the same time, the special needs of the clients for, inevitably there are some materials or asymmetric structure of plate, the above analysis of the deformation caused by the different CTE will be very obvious, for this kind of problem we can try to use a symmetrical laminated way to solve, the principle for the buffer material of asymmetric reached PCB double-side heating speed, which affects different CTE core cypress in the heating and cooling phase increases and to solve the problem of inconsistent deformation. By means of asymmetric folding, and after compression, the post-curing process is added, and the leveling operation is conducted before the delivery, which finally meets the requirements of the customer 2.0mm. PCB production process, in addition to the pressure and resistance welding and character as well as the hot air leveling, several high temperature processing of resistance welding, after the characters of the highest temperature of 150 ℃ drying plate on the above mentioned this temperature in normal Tg above Tg for the material, the material for high elastic state, easy to deformation under the external force, so that to avoid drying plate laminated to prevent the lower plate is bent, at the same time to ensure when baking plate plate a direction parallel to the flow direction.In the process of hot air leveling, it is necessary to ensure that the plate can be cooled for more than 30s, and avoid cold water washing after high temperature. In addition to the production process, PCB parts stored in each station also has certain influence to the deformation, in some factories because of the delivery is more narrow, site, will be more than plate stacking together, it will also lead to plate by the external force deformation, due to the PCB also has certain plasticity, so the deformation in the back of the leveling process will not get the recovery of 100%. Most PCB manufacturer before shipment will be leveling process, this is because in the machining process will inevitably produce heat or mechanical force of plate deformation, through mechanical leveling before shipment or hot baked leveling can be effectively improved.Blocked welding and surface coating layer of heat resistance, general drying plate temperature below 140 ℃ ~ 150 ℃, just more than ordinary materials Tg temperature, it is of great benefit to the leveling of ordinary plate, and for leveling effect of high Tg material is not so obvious, so the individual board become warped serious high Tg board can improve the drying plate temperature appropriately, but the main quality of printing ink and coating layer.Baking plate at the same time weight, increase with the practice of furnace cooling time also played a certain role to improve the deformation, table 5 for the different weights and furnace cooling time on board a leveling effect of the test results, from which you can see add weight and prolong furnace cold leveling has obvious effect on deformation.